Interests:All things military, Shooting, Cycling, Hiking and Camping. AUSA: General Dynamics looks like the early favorite to replace the Army’s 1980s-vintage M2 Bradley troop carrier. That’s my personal assessment after talking at length to officers and contractors at last week’s Association of the US Army conference, where months of uncertainty finally gave way to some real clarity about both what the Army wants and what industry can offer.  but the General Dynamics Griffin III is in the middle, combining a new gun and new electronics with the time-tested chassis from the European ASCOD family. The competitors do have a lot in common. All offer tracked vehicles with diesel engines — even BAE, which once touted its hybrid-electric drives as a key selling point. All three boast open-architecture electronics to ease future upgrades, an integrated Active Protection System to shoot down incoming anti-tank warheads, modular armor that can be layered on or stripped down depending on the mission, and a turret capable of mounting a 50 mm gun, the Army’s preferred caliber. Only the Griffin actually has a 50mm installed right now, however. The others currently have 35mm cannon. It’s also the only vehicle that can point its gun almost straight up, at an 85 degree angle, to hit rooftop targets in urban combat, something the Army has worried about extensively. Details like this suggest that General Dynamics has been listening more closely to the Army than its competitors. In fact, even where the Griffin III underperforms its competitors, most notably by carrying fewer infantry, it does so in areas where the Army is willing to make tradeoffs. There is more at the link, rather longish article actually. Thoughts/opinions? The 50mm thing surprised me for some reason. The 50mm thing surprised me for some reason. 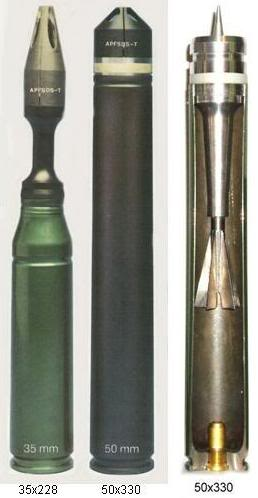 50 mm SUPERSHOT uses the same cartridge case as 35 × 228 mm, widened to take the bigger projectile. Prime example is the Rheinmetall Rh503 machine cannon, that can shoot both wiht a barrel swap. I think the big Bushmaster III can do so as well. what is looking weird is that hexagonal camonetting(?) or whateever it is to break up the surface area and I guess reduce radar signature? edit the sales guy says it is an IR and acoustic camouflage. Interesting. they have really thrown everything possible on the demonstrator. Edited by Panzermann, 16 October 2018 - 1656 PM. That should disqualify the Griffin right away. You get a squad of 9 with Lynx on TO&E, 7 or 8 in practice (personnel unavailable, additional stuff stored, upgrades take up volume). Griffin is merely an autocannon combat vehicle with ability to carry a fireteam. Besides, I suspect the gun elevation is rather of interest for UAV killing, as common IFV gun elevations are fine enough for urban scenarios. Anything under 13 should DQ it IMO to give more flexibility for cross loading and future TO&E / doctrine changes. Damn thing is the size of a self propelled howitzer. Edited by Burncycle360, 16 October 2018 - 2055 PM. The US Army is willing to compromise on the amount of dismounts, for a total of 6. Having 9 is by no means mandatory anymore. This is in part because of the whole concept behind the OMFV - They should have enough vehicles for all tasks that repurposing one to carry additional troops should be a non-issue. I'm intrigued how they expect to fit even 6 crew and a turret for a huge gun breech like the Bushmaster 50 with that elevation capability in an ASCOD. Are they stretching it? CF with Ajax, which doesn't match that with the CT40, which is more compact. I for one am thrilled that the 50 mm Supershot may actually see operational use 30 years on. Though I won't bet on the project coming to fruition any more than its half-dozen Future Awesome Fighting Vehicle predecessors. The US military is not interested in the Supershot round, (50 x 330 mm) but a slightly smaller catridge (50 x 228 mm). Edited by methos, 17 October 2018 - 0804 AM. Oh, I hadn't even heard of that. Is it still meant to be fired from an up-bored gun though? Because the article mentions initially settling on a 30 mm before going to the 50 mm later. Crewless turret i suppose. Hard to tell if the hull is longer. The 50 mm gun seems to be a development from the Bushmaster III (where a simple barrel swap would allow changing the caliber from 35 x 228 mm to 50 x 228 mm), but is supposedly a new development meant to be primarily (or only) used with the larger caliber. The 50 mm x 228 mm catridge (excluding the projectile) is barely bigger than the 35 mm x 228 mm catridge and quite a bit smaller than the Supershot. The new 50 mm gun during tests. Super double extra good for killing crunchies. This ancient diagram illustrates the issue. The larger diameter the round, the less efficient it is storagewise. If you want a good indication of the various options between 0.50 and 40mm L70 modelled really lovingly (down to a round counter on the Marder) with the correct optics and FCS, vs a wide variety of targets and in scenarios of yiur design, you could do a lot worse than check out Steel Beasts. Prepare to be horribly addicted though. Is the Army considering the new 40mm CTAS guns being used by the British and French, or is the choice between a 30mm and 50mm? Havent seen any US interest in 40mm CTAS. There is not a chance in hell of the US going with CT 40. If for no other reason than "not invented here". Given the AFV guns with a European origin like the M240, 105 mm, and 129 mm, I wouldn't be as confident. Even the original 40 mm in US service was European. I think that had to do with nothing the US Army Ordnance Department (or the equivalent Navy bureau) or the private sector had to offer was comparable. Or anyhting offered at all. Edited by Panzermann, 27 October 2018 - 1340 PM. I dunno about that. The M60 could have been adapted as a coax and retained as a GPMG instead of the M240. Is there an all-American 40 mm? Edited by R011, 27 October 2018 - 1432 PM.